This week our team was in Raleigh for an all staff meeting. It is always so grand to have all of us together. It is a bit like a cross between a family reunion and pep rally - the energy and enthusiasm is contagious. But this time we had a special guest join us. We had an opportunity to have a real lesson in leadership. 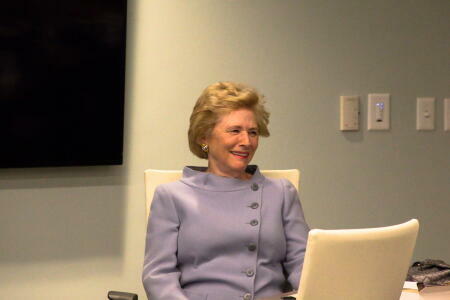 Elizabeth Fentress, the founding executive director of the North Carolina Community Foundation joined us to share her passion, experience and memories. Elizabeth began in 1988 and led the organization from its humble beginnings around a card table with an electric typewriter to a vibrant statewide community foundation with assets of over $105M. She retired in 2006 after 17 years at the helm. Although we now we only have a handful of staff who worked directly with her, all our staff knows who she is and had longed to meet her. She shared with us an intimate look at the history and vision behind the establishment of the Foundation: the long hours, the challenges, the success and the relationships that were built. Through her stories it was clear: you could feel the passion she has for serving rural North Carolina and for establishing a community foundation that provided a future for some of our communities for which the future sometimes looks bleak. Liz gave us a real lesson in leadership, a lasting lesson of being accountable, being on time, and making sure we look the part. Knowing our history is important. It helps us place things in context and to see how we are reflected in the path forward. We are all a part of something larger than ourselves that will go on long after we are not here. Having information, compassion, and an understanding of our history helps us become stronger in our future. Our work has one foot in our history and one foot in our future. Click here to read more on Fentress' experience at the Foundation.